Araya A. Hargate had me positively swooning, when she swept back onto the Cannes Film Festival red carpet for the ‘Sink Or Swim (Le Grand Bain)’ premiere on Sunday (May 13), joining Jane Fonda and Isabelle Huppert. 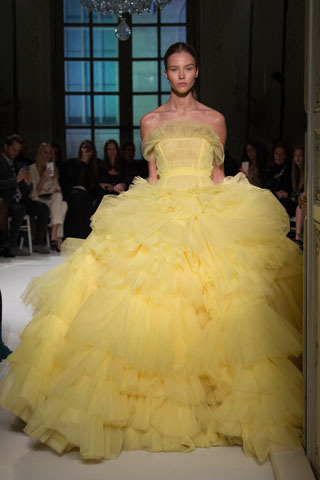 If you’re anything like me, you immediately had a mild case of déjà vu upon seeing this Giambattista Valli Spring 2017 Haute Couture confection. That’s because this whimsical flurry of a fashion daydream was similar to her breathtaking Zuhair Murad entrance last year. Yet again, she expertly navigated the undulating waves of tulle. But, while this luscious lemon hue was ever so delightful, I found the intense magenta hue of her 2017 moment to be more memorable. That aside, I would say that her jewelry game was stronger this year, as the extravagance of that Chopard necklace was pretty much unmatchable.